I may have just discovered my favourite food of all time: Panade. What is a panade you may ask? 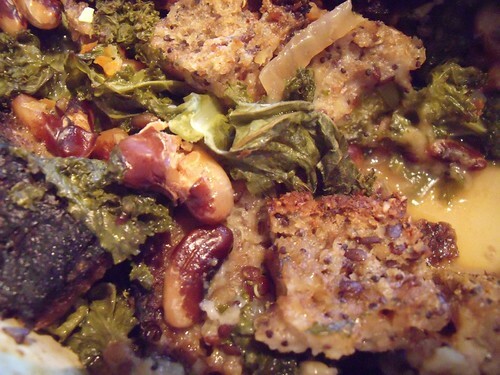 Well, it’s a savoury bread pudding that tastes like French onion soup with soggy bread. 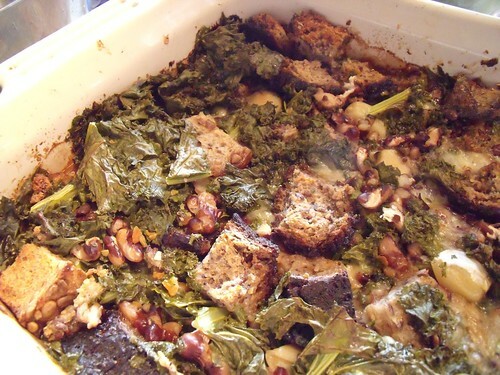 Which I know is not the most appealing-sounding thing — but think about it: a bread casserole baked in veggie stock with roasted onions and melty Swiss cheese. What could go wrong? 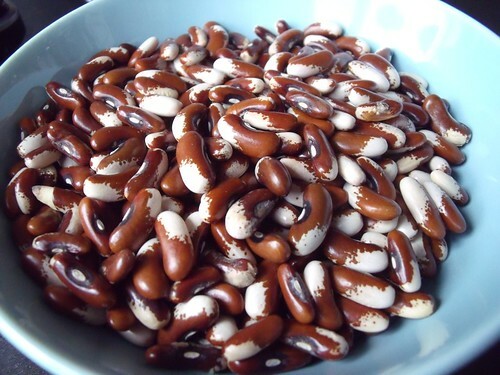 I had some local & organic heirloom beans: pony beans to be precise! Don’t they look like little paint horses? And I thought they’d turn my panade from a bread-veggie side dish into a bread-beans-veggie meal! Oooh, they’re so pretty and they make the panade extra-filling! 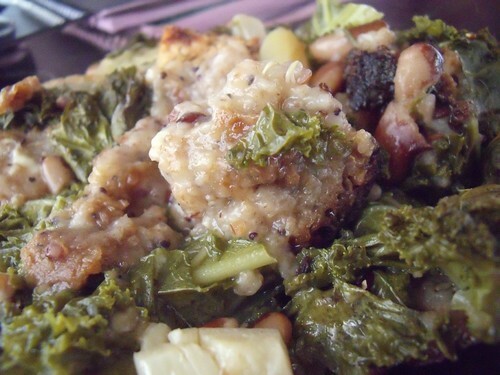 This panade is a great way to use up whatever stale bread you have on hand! I used up half a loaf of a multigrain struan I made from a Peter Reinhart recipe (which I will post soon) and my whole wheat starter, Fluffy. In terms of the melty cheese, I thought I’d use up the leftover Gruyère & parmesan from the Gruyère & Tarragon Soufflés. The Swiss Gruyère is a great cheese to give body and flavour to a dish when you want something melty and rich. I’m naming it my official “Cheese-of-Autumn“! I promise, you will not be disappointed with this one. I’m going to be making it all winter! Toss the onions with the oil in a large casserole dish, and pop into the oven at 425F for 45-60 minutes, until the onions soften, brown, and become sweeter. 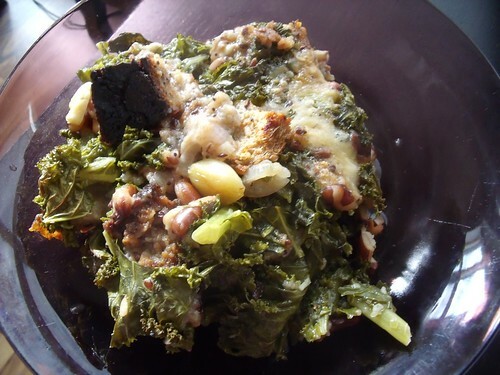 In a large bowl, combine bread cubes, garlic cloves, kale, beans, and cheese. Mix well. Combine with the cooked onions in the casserole dish. Season with salt & pepper to taste. 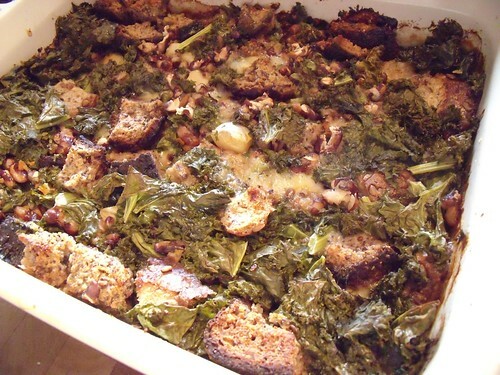 Pour the veggie stock over the bread/veggie mixture, and cover the casserole dish with a lid or aluminum foil. Bake the panade at 375F for 30-40 minutes, until the broth has been absorbed, the cheese has melted. Uncover the dish, and cook for 20 minutes more and the panade is browned around the edges. Serve immediately, and enjoy the soggy deliciousness. Reheat any leftovers by pan-frying scoops of panade in a large pan with a teaspoon of olive oil. 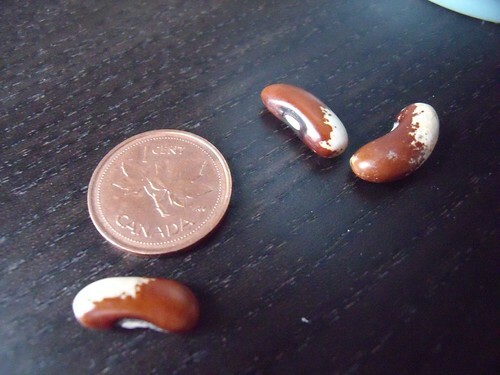 I never thought a bean could be ‘adorable’ but those Pony Beans are too much!